Another Set Of Credit Cards Bite The Dust! I provide one-on-one financial counseling to over 450 people per year. This helps me accomplish my passion which is "to help others accomplish far more than they ever thought possible with their personal finances". Anyway, I met with a couple for the first time 42 days ago – just six weeks ago. I met with them again for a follow-up meeting and here are some of their accomplishments – IN JUST SIX WEEKS! 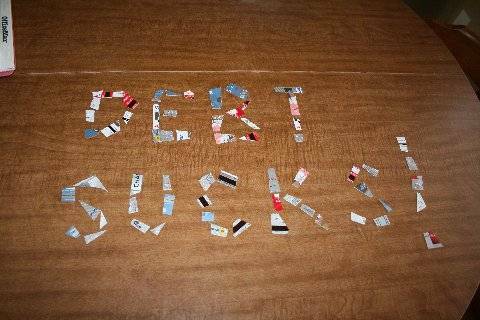 As you can see from the above picture, they have chopped up their credit cards! THEY have not used credit for the last six weeks! HE is taking his lunch to work every single day! THEY shut off their cell phones! THEY paid CASH for Christmas!!! THEY have put money into their ING SAVINGS ACCOUNT! THEY put their house up for sale to get rid of their huge monthly payment! THEY have a written plan that is EZ to follow! THEY are going to win big time! In just SIX WEEKS, they were able to accomplish all of this!!! I am FIRED UP!!! That is what this whole crusade is about! Freeing up people to be able to go do EXACTLY what they have been put on this earth to do. Do YOU have a success story you want to share? Click HERE to share your successes – both large and small – with the www.JosephSangl.com readers! THEY paid CASH for Christmas!!! —Weird !